Perfect for warming up jars and bottles at the same time! 2-in-1 warmer keeps lotions, oils, gels, and scrubs just above body temperature (90 - 122°F) for a comfortable, soothing service. Contains one warmer sleeve for jars and one warmer sleeve for bottles, and is kept warm by an internal thermostat-controlled heating element. 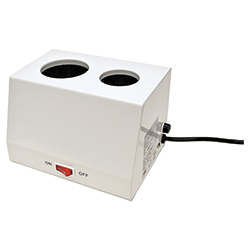 Jar warmer sleeve fits most jars up to 3-1/2" Diameter and 3-1/2" Deep. Lotion warmer sleeve fits an 8 oz. 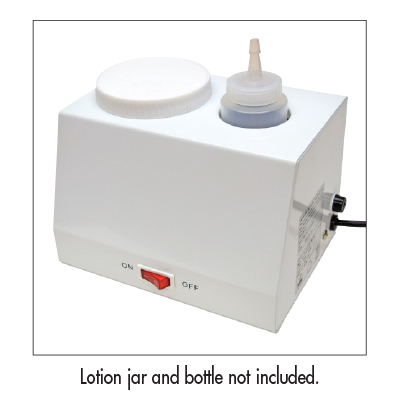 lotion bottle and measures 2" Diameter and 5" Deep. Features a 7 ft. power cord and white powder coat finish. Measures: 5-1/2"H x 7-3/4"W x 6"D.